Gary Edward "Garrison" Keillor (born August 7, 1942) is an American author, storyteller, humorist, radio actor, voice actor, and radio personality. 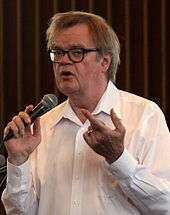 He is known as creator of the Minnesota Public Radio show A Prairie Home Companion (called Garrison Keillor's Radio Show in some international syndication), which he hosted from 1974 to 2016. Keillor created the fictional Minnesota town Lake Wobegon, the setting of many of his books, including Lake Wobegon Days and Leaving Home: A Collection of Lake Wobegon Stories. Other creations include Guy Noir, a detective voiced by Keillor who appeared in A Prairie Home Companion comic skits. Keillor was born in Anoka, Minnesota, the son of Grace Ruth (née Denham) and John Philip Keillor, who was a carpenter and postal worker. His father had English ancestry, partly by way of Canada; Keillor's paternal grandfather was from Kingston, Ontario. His maternal grandparents were Scottish immigrants, from Glasgow. Keillor’s natal family belonged to the Plymouth Brethren, an Evangelical Christian movement that he has since left. In 2006 he told Christianity Today that he was attending the St. John the Evangelist Episcopal church in Saint Paul, after previously attending a Lutheran church in New York. Keillor is a member of the Democratic-Farmer-Labor Party; he is six feet, three inches (1.9 m) tall. Keillor considers himself a loner and prefers not to make eye contact with people. Though not diagnosed, he also considers himself to be on the high-functioning end of the autism spectrum. He spoke about his experiences as an autistic person in his keynote address at the 19th Annual Minnesota Autism Conference in 2014. To Mary Guntzel, from 1965 to 1976. They had one son, Jason, born in 1969. To Ulla Skaerved, a former exchange student from Denmark at Keillor's high school whom he re-encountered at a class reunion, from 1985 to 1990. To violist Jenny Lind Nilsson (b. 1957), who is also from Anoka, since 1995. They have one daughter, Maia Grace Keillor, born December 29, 1997. Between his first and second marriages, he was romantically involved with Margaret Moos, who worked as a producer of A Prairie Home Companion. In his 2004 book Homegrown Democrat: A Few Plain Thoughts from the Heart of America, Keillor mentions some of his noteworthy ancestors, including Joseph Crandall, who was an associate of Roger Williams, who founded Rhode Island and the first American Baptist church, and Prudence Crandall, who founded the first African-American women's school in America. Garrison Keillor started his professional radio career in November 1969 with Minnesota Educational Radio (MER), later Minnesota Public Radio (MPR), which today distributes programs under the American Public Media (APM) brand. He hosted a weekday drive-time broadcast called "A Prairie Home Entertainment", on KSJR FM at St. John's University in Collegeville. The show's eclectic music was a major divergence from the station's usual classical fare. During this time he submitted fiction to The New Yorker magazine, where his first story for that publication, "Local Family Keeps Son Happy," appeared in September, 1970. Keillor resigned from The Morning Program in February 1971 in protest of what he considered interference with his musical programming; as part of his protest, he played nothing but the Beach Boys' "Help Me, Rhonda" during one broadcast. When he returned to the station in October, the show was dubbed A Prairie Home Companion. Keillor has attributed the idea for the live Saturday night radio program to his 1973 assignment to write about the Grand Ole Opry for The New Yorker, but he had already begun showcasing local musicians on the morning show, despite limited studio space. In August 1973, MER announced plans to broadcast a Saturday night version of A Prairie Home Companion with live musicians. A Prairie Home Companion (PHC) debuted as an old-style variety show before a live audience on July 6, 1974; it featured guest musicians and a cadre cast doing musical numbers and comic skits replete with elaborate live sound effects. Today the show is punctuated by spoof commercial spots for PHC fictitious sponsors such as Powdermilk Biscuits, the Catchup Advisory Board, and the Professional Organization of English Majors (POEM); it presents parodic serial melodramas, such as The Adventures of Guy Noir, Private Eye and The Lives of the Cowboys. Keillor voices Noir, the cowboy Lefty, and other recurring characters, and provides lead or backup vocals for some of the show's musical numbers. The show airs from the Fitzgerald Theater in St. Paul. After the show's intermission, Keillor reads clever and often humorous greetings to friends and family at home submitted by members of the theater audience in exchange for an honorarium. Also in the second half of the show, Keillor delivers a monologue called The News from Lake Wobegon, a fictitious town based in parts on Keillor's own hometown of Anoka, Minnesota, and on Freeport and other small towns in Stearns County, Minnesota, where he lived in the early 1970s. Lake Wobegon is a quintessentially Minnesota small town characterized by the narrator as "... where all the women are strong, all the men are good-looking, and all the children are above average." The original PHC ran until 1987, when Keillor ended it to focus on other projects. In 1989, he launched a new live radio program from New York City, "The American Radio Company of the Air", which had essentially the same format as PHC. 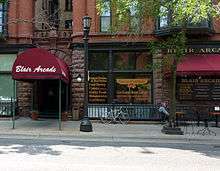 In 1992, he moved ARC back to St. Paul, and a year later changed the name back to A Prairie Home Companion; it has remained a fixture of Saturday night radio broadcasting ever since. On a typical broadcast of A Prairie Home Companion, Keillor’s name is not mentioned unless a guest addresses him by name, although some sketches feature Keillor as his alter ego, Carson Wyler. In the closing credits, which Keillor reads, he gives himself no billing or credit except "written by Sarah Bellum", a joking reference to his own brain. Keillor regularly takes the radio company on the road to broadcast from popular venues around the United States; the touring production typically features local celebrities and skits incorporating local color. In April 2000, he took the program to Edinburgh, Scotland, producing two performances in the city's Queen's Hall, which were broadcast by BBC Radio. He toured Scotland with the program to celebrate its 25th anniversary. (In the UK, Ireland, Australia, and New Zealand, the program is known as Garrison Keillor's Radio Show.) Keillor has produced broadcast performances similar to PHC but without the "Prairie Home Companion" brand, as in his 2008 appearance at the Oregon Bach Festival. He is also the host of The Writer's Almanac, which, like PHC, is produced and distributed by American Public Media. In a March 2011 interview, Keillor announced that he would be retiring from A Prairie Home Companion in 2013; but in a December 2011 interview with the Sioux City Journal, Keillor said: "The show is going well. I love doing it. Why quit?" During an interview on July 20, 2015, Keillor announced his intent to retire from the show after the 2015–2016 season, saying, "I have a lot of other things that I want to do. I mean, nobody retires anymore. Writers never retire. But this is my last season. This tour this summer is the farewell tour." Keillor's final episode of the show was recorded live for an audience of 18,000 fans at the Hollywood Bowl in California on July 1, 2016,  and broadcast the next day, ending 42 seasons of the show. After the performance, President Obama phoned Keillor to congratulate him. The show continued on October 15, 2016 with Chris Thile as its host. At age thirteen, Keillor adopted the pen name "Garrison" to distinguish his personal life from his professional writing. He commonly uses "Garrison" in public and in other media. Keillor wrote the screenplay for the 2006 movie A Prairie Home Companion, directed by Robert Altman. He also appears in the movie. In April 2012, the store moved to a new location on Snelling Avenue across from Macalester College in the Macalester-Groveland neighborhood. In 1991, Keillor released Songs of the Cat, an album of original and parody songs about cats. In 2005, Keillor's attorneys sent a cease-and-desist letter to MNSpeak.com regarding their production of a T-shirt bearing the phrase "A Prairie Ho Companion." In 2006, after a visit to a United Methodist Church in Highland Park, Texas, Keillor created a local controversy with his remarks about the event, including the rhetorical suggestion of a connection between event participants and supporters of torture and a statement creating an impression of political intimidation: "I walked in, was met by two burly security men ... and within 10 minutes was told by three people that this was the Bushes' church and that it would be better if I didn't talk about politics." In response, the lecture series coordinator said the two “burly security men” were a local policeman and the church’s own security supervisor, both present because the agreement with Keillor‘s publisher specified that the venue provide security. In addition the coordinator said Mr. Keillor arrived at the church, declined an introduction and took the stage without an opportunity to mingle with the audience, and so did not know when these warnings might have been dispensed. The publicist concurred, saying that Keillor did not have contact with any church members or people in the audience before he spoke. Supposedly, before Keillor's remarks, participants in the event had considered the visit to have been cordial and warm. Asked to respond, Keillor stuck to his story, describing the people who advised him not to discuss politics and saying that he did not have security guards at other stops on the tour. I live in a small world – the world of entertainment, musicians, writers – in which gayness is as common as having brown eyes... And in that small world, we talk openly and we kid each other a lot. But in the larger world, gayness is controversial... and so gay people feel besieged to some degree and rightly so... My column spoke as we would speak in my small world, and it was read by people in the larger world and thus the misunderstanding. And for that, I am sorry. Gay people who set out to be parents can be just as good parents as anybody else, and they know that, and so do I. In 2008, Keillor created a controversy in St. Paul when he filed a lawsuit against his neighbor's plan to build an addition on their home, citing his need for "light and air" and a view of "open space and beyond". Keillor's home is significantly larger than others in his neighborhood and would still be significantly larger than his neighbor's with its planned addition. Keillor came to an undisclosed settlement with his neighbor shortly after the story became public. In 2009, one of Keillor's "Old Scout" columns contained a reference to "lousy holiday songs by Jewish guys" and a complaint about "Silent Night" as rewritten by Unitarians, upsetting some readers. A Unitarian minister named Cynthia Landrum responded, "Listening to him talk about us over the years, it's becoming more and more evident that he isn't laughing with us — he's laughing at us", while Jeff Jacoby of the Boston Globe called Keillor "cranky and intolerant". In Slate, Sam Anderson called Keillor "very clearly a genius. His range and stamina alone are incredible—after 30 years, he rarely repeats himself—and he has the genuine wisdom of a Cosby or Mark Twain." 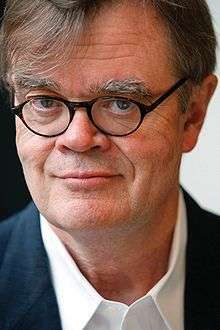 But Keillor's "willful simplicity", Anderson wrote, "is annoying because, after a while, it starts to feel prescriptive. Being a responsible adult doesn’t necessarily mean speaking slowly about tomatoes." Anderson also noted that in 1985, when Time magazine called Keillor the funniest man in America, Bill Cosby said, "That’s true if you’re a pilgrim." Keillor's style, particularly his speaking voice, has often been parodied. The Simpsons parodied him in an episode in which the family is shown watching a Keillor-like monologist on television; they are perplexed at why the studio audience is laughing so much, prompting Homer to ask "What the hell's so funny?" and Bart to suggest "Maybe it's the TV." Homer then hits the set, exclaiming: "Stupid TV! Be more funny!" Harry Shearer, who portrayed the Keillor sound-alike, has also parodied Keillor on Shearer's own public radio series, Le Show. On the 2005 Family Guy episode "Don't Make Me Over", Peter's band Fat, Horny, Black, and Joe accidentally starts a prison riot. In an attempt to quell it, he shouts over the hullabaloo, "Hey, how about a funny story about Lake Wobegon? It was the day of the tuna hot-dish jamboree..." and is cut off when a chair hits him. Pennsylvanian singer-songwriter Tom Flannery wrote a song in 2003 titled "I Want a Job Like Garrison Keillor's." Keillor is referred to in Garry Trudeau's comic strip Doonesbury, when his radio show aggravates Governor Jesse Ventura to the point where Uncle Duke, working on Ventura's staff, takes one of Ventura's rants as an indirect order to assassinate Keillor. In Bret Easton Ellis's novel American Psycho, the main character, Patrick Bateman, flips through a book by Keillor while waiting for a date to arrive. Two parody books by "Harrison Geillor", The Zombies of Lake Woebegotten and The Twilight of Lake Woebegotten, were published by Night Shade Books in 2010 and 2011. He has also received two CableACE Awards and a George Foster Peabody Award. ↑ Wadler, Joyce (June 7, 2006). "Where all the rooms are above average / Garrison Keillor's home not a little house on the prairie". The San Francisco Chronicle. ↑ Landsend.com Archived April 3, 2012, at the Wayback Machine. 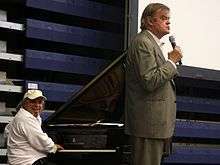 ↑ "Garrison Keillor sounds at home on CBC Radio". Pqasb.pqarchiver.com. 1996-02-26. Retrieved 2015-03-04. ↑ "Ancestry of Garrison Keillor". Wargs.com. Retrieved 2015-03-04. ↑ Irss.uoguelph.ca Archived November 9, 2013, at the Wayback Machine. ↑ "Grace Keillor, mother of Garrison, passes away at age 97 | State of the Arts | Minnesota Public Radio News". Minnesota.publicradio.org. 2012-07-27. Retrieved 2015-03-04. ↑ "From the Radio to the Big Screen". Christianity Today. 2006-06-05. Retrieved 2015-03-04. ↑ Powers, John (August 10, 2008). "Plenty of niceness, and no ice, for a Grand Old Party". The Boston Globe. ↑ Salon Archived April 24, 2011, at the Wayback Machine. ↑ Keillor, Garrison (April 15, 2010). "Post to the Host: 7th Grade Report". A Prairie Home Companion. Archived from the original on September 21, 2010. Retrieved 2010-09-05. ↑ "Garrison Keillor and Jenny Lind Nilsson - Marriage Profile". Marriage.about.com. Retrieved 2015-03-04. ↑ "Garrison Keillor What He Did For Love". Chicago Tribune. February 12, 1986. 1 2 Wadler, Joyce (June 1, 2006). "Where All the Rooms Are Above Average". The New York Times. ↑ "A Prairie Home Companion from American Public Media". American Public Media. January 2, 1998. Retrieved December 24, 2010. ↑ "Garrison Keillor". John Rosengren. Retrieved 2015-03-04. ↑ Walsh, Paul (September 9, 2009). "Minor stroke puts Keillor in hospital". Star Tribune. Retrieved September 9, 2009. ↑ Keillor, Garrison (2004). Homegrown Democrat. New York: Penguin Books. pp. 39–40, 84. ISBN 0-14-303768-4. ↑ Keillor, Garrison (2004). Homegrown Democrat. New York: Penguin Books. p. 84. ISBN 0-14-303768-4. ↑ Lee, J. Y. Garrison Keillor: A Voice of America, pp. 29–30. University Press of Mississippi, 1991. ↑ Garrison Keillor, page 30. University Press of Mississippi, 1991. ↑ Garrison Keillor, page 32. University Press of Mississippi, 1991. ↑ "Keillor to Quit Daily Show, Others Leave KSJN, Minneapolis Tribune, 1973-08-24, 14B. ↑ Garrison Keillor, pp. 35, 85. University Press of Mississippi, 1991. ↑ Keillor, Garrison (2001). In Search of Lake Wobegon. New York: Viking Studio. pp. 12–13. ISBN 978-0-670-03037-8. ↑ "A Prairie Home Companion". A Prairie Home Companion. Retrieved 2016-11-14. ↑ "Oregon Bach Festival pressroom". Retrieved August 17, 2009. ↑ "Garrison Keillor, 'Prairie Home Companion' Host, to Retire From Radio". The Hollywood Reporter. March 17, 2011. Retrieved March 30, 2011. ↑ Miller, Bruce (December 1, 2011). "Garrison Keillor keeps the home fires burning". Sioux City Journal. Retrieved January 22, 2012. ↑ Associated Press, Garrison Keillor hosts final A Prairie Home Companion episode, The Guardian, 2 July 2016. ↑ Justin, Neal (June 18, 2016). "Sun is setting on Garrison Keillor's time on Lake Wobegon". eMinneapolis Star Tribune. ↑ "Keillor turns out the lights on Lake Wobegon". New York Times. ↑ "Minnesota Author Biographies: Garrison Keillor". Minnesota Historical Society. Retrieved September 11, 2016. ↑ Randall Balmer: Encyclopedia of Evangelicalism. Revised and expanded edition 2004, Baylor University Press. ↑ "In Search of Lake Wobegon @". Nationalgeographic.com. Retrieved 2015-03-04. ↑ Miller, Laura (2001-09-04). "Every dog has his day". Salon.com. Retrieved 2015-03-04. ↑ "Liberal - Political". www.tmsfeatures.com. Retrieved 2015-03-04. ↑ Webb, Tom (December 2, 2011). "Keillor's bookstore outgrows St. Paul space and will move to Macalester College campus". St. Paul Pioneer Press. Retrieved May 28, 2013. ↑ "Common Good Books Opens at Macalester". Retrieved January 29, 2015. ↑ Craine, Tatiana (May 7, 2012). "Garrison Keillor's Common Good Books re-opens in new location". Citypages.com. Archived from the original on May 29, 2013. Retrieved May 28, 2013. ↑ Creativeclub.co.uk Archived September 29, 2007, at the Wayback Machine. ↑ Umportal.org Archived February 29, 2012, at the Wayback Machine. ↑ Floyd, Jacquielynn (October 4, 2006). "Keillor's Dallas jabs read like fictional tale". Dallas Morning News. Archived from the original on October 11, 2006. ↑ Chicago Tribune Archived November 9, 2013, at the Wayback Machine. ↑ "To the worker ants of science". Salon.com. 2007-03-21. Archived from the original on June 29, 2008. Retrieved 2015-03-04. ↑ "StarTribune.com: News, weather, sports from Minneapolis, St. Paul and Minnesota". Kerstenblog.startribune.com. 2015-02-26. Retrieved 2015-03-04. ↑ "Mediation ends Keillor's feud with neighbor". Star Tribune. Retrieved 2015-03-04. ↑ "Garrison Keillor Christmas | Nonbelievers, please leave Christmas alone - Baltimore Sun". Articles.baltimoresun.com. 2009-12-16. Retrieved 2015-03-04. ↑ Cynthia Landrum (2009-12-17). "Rev. Cyn: Garrison Keillor Is no "Companion" for Unitarian Universalists". Revcyn.blogspot.com. Retrieved 2015-03-04. ↑ "Musings, random and otherwise - The Boston Globe". Boston.com. Retrieved 2015-03-04. ↑ Snpp.com Archived December 4, 2014, at the Wayback Machine. ↑ "'SNL' Spoofs Garrison Keillor". WCCO-TV. November 20, 2011. Retrieved March 27, 2015. ↑ Boston.com Archived June 30, 2008, at the Wayback Machine. ↑ "I Want a Job Like Garrison Keillor's". Songaweek.com. 2003-11-13. Retrieved 2015-03-04. ↑ "Books by Harrison Geillor". Night Shade Books. Retrieved 8 February 2016. 1 2 3 4 "Something for Everyone". School of the Arts: University of North Carolina. Retrieved April 26, 2011. ↑ "Index". Museum.tv. 2014-11-09. Retrieved 2015-03-04. ↑ "Welcome to Minnesota - Minnesota Historical Markers on". Waymarking.com. Retrieved 2015-03-04. ↑ Themoth.org Archived March 19, 2011, at the Wayback Machine. Wikimedia Commons has media related to Garrison Keillor.